In some cases drains can be structurally sound, except the seal of the joints (usually rubber rings) have deteriorated and lost their tight seal. In this situation Drainwise can prevent tree roots from growing back through these joints, by applying Vaporooter tree root control foam, to the inside of your drains. 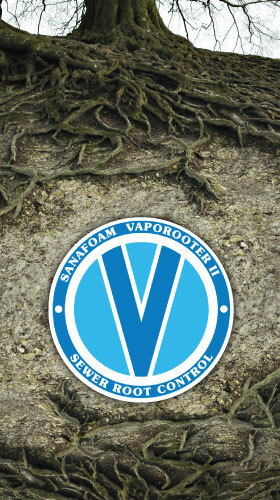 Vaporooter is a process of covering the roots inside your drain with herbicide foam. This foam kills and sterilises the tree roots in the vicinity of the drain. the herbicide only travels a very short distance up the tree root which means in does not affect the growth of the tree(s). The process is so effective we give you a 12 month guarantee, against tree root blockages in that section of drain. Once the problems have been identified, the drain is cleaned using high pressure water. 6 weeks after cleaning, the Vaporooter foam is applied to the inside of the drain. A Report showing the treated sections of drainage is supplied, along with a written guarantee. 12 months later, Vaporooter is reapplied to the drain, this prevents the tree roots from doing anymore damage to Your drain. Vaporooter does NOT harm your trees or shrubs! Avoid costly excavation to replace your drainage system. Keep your drains more reliable, preventing emergency callouts.